What is a "Casual Game?" 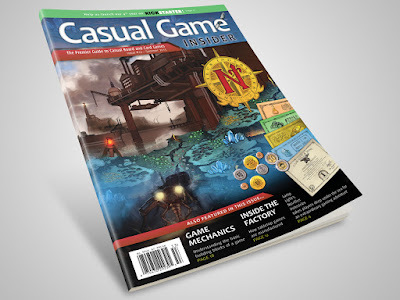 Casual Game Insider magazine is fantastic game magazine that puts a focus on "casual games." They provide news, reviews, and great articles ranging from game mechanics, to board gaming conventions, to spotlighting game publishers/designers, and more. Casual Game Insider is the best gaming magazine available in my opinion. I hope that they can continue to expand - it would be great to get this monthly! Such a well done publication and a very enjoyable read. Right now you can actually download a pdf of the summer issue for FREE (see link below). There is also a link provided to view the issue in an online reader. Please enjoy! And don't forget to check out the Kickstarter page and their website (links above). If you like games or want to learn more, this magazine is for you and that is How Lou Sees It!